Bored with how your iPhone looks? If you have it jailbroken, you can install iPhone themes and make the device look a lot different than iOS by using an app called Dreamboard. If you haven’t jailbroken yet, backup the iPhone and then proceed with Absinthe for iPhone 4S on iOS 5.0.1 or Redsn0w for iOS 5.0.1 on other iPhones and iPods. Dreamboard is then found as a free download in Cydia, so search for it and install. There are plenty more, and while a lot of the themes are free, others cost a buck of two. Some paid themes have to be downloaded manually and then moved to the iPhone with SSH and SFTP from a Mac or PC, others can be installed directly on the phone. Heads up to Lifehacker for the basic theme ideas. If you have to customize your phone to look like another phone, you have the wrong phone. Exactly, plus Dreamboard makes the iPhone so unstable it’s basically useless. It has a novelty value that lasts about 10 minutes until you experience app crashing. There are multiple reasons to change the look of your phone and not switch devices. People may prefer the iOS interface but want the access to battery/memory card/universal ports that Android phones offer. 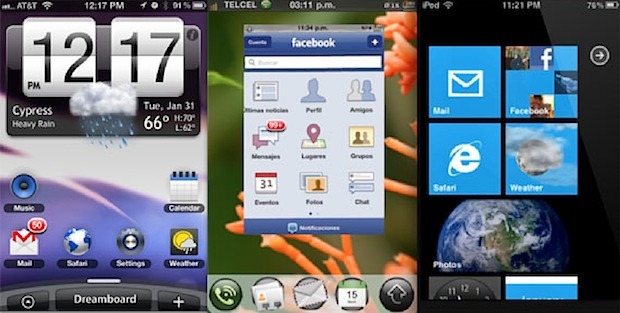 Maybe they like the high quality Apple hardware but prefer the more simplistic WP7 interface. Perhaps someone’s thinking about switching so they’re trying a new theme for a few weeks to see if it’s a good fit. Just because your phone’s current look isn’t your favorite, doesn’t mean you have the wrong phone. Theme your Aston Martin to look like a Lada Niva! What’s the point in making your iPhone look like Android crap? Shoot! The Apple Desk them bricked my iPod touch! It keeps restringing, without loading anything. Please help me!